Partington Trophy review | What Hi-Fi? Hefty, glossy and eminently useable for speakers great and small. Criticism first: the Trophies can be just fractionally tentative at the bottom end of the range, though there's no shortage of presence. In every other respect, these stands are as exceptional as we've come to expect from Partington. The sound is beautifully judged: the soundstage is coherent, detail and separation aren't sacrificed in favour of integration, and the midrange is natural as can be. 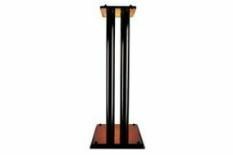 Dynamic, poised, solidly built, and not as industrially brutal-looking as other Partington designs, the Trophies are ideal speaker stands.